Read this. 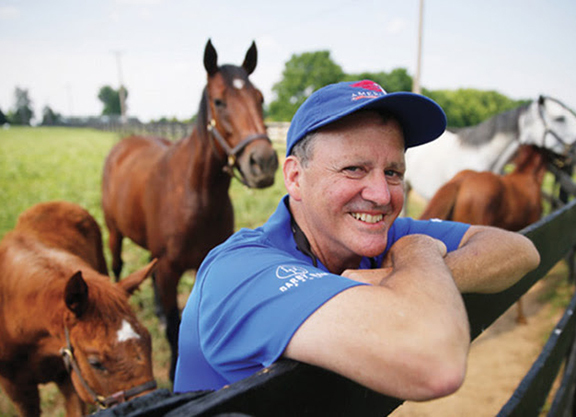 No, seriously, if you care for Thoroughbred racing at all and especially if you work or are invested in Thoroughbred racing or any of the many parts that surround it–click here and read this. Is this article unbalanced? Balance was not even attempted. Is the context accurate? It throws our breed in with the pro-slaughter Quarter Horse horsemen. Does it misrepresent our industry’s efforts and where our sport is heading? It makes it sound like we don’t even care, let alone spend increasing millions annually on horses retiring from the track. Can Thoroughbred racing expect more of this type of reporting? Absolutely. This is Preakness week and we should be reading and thinking about the awesome drama about to unfold on Saturday. Instead, this was what we got from the Washington Post. Run in newspapers across the country, this kind of story is killing our sport. And our sport no longer has the luxury of sports-page standing to combat such disastrous public relations. At this stage, the only thing that Thoroughbred racing can do, and must do, if we want to survive, is to address the issue even more earnestly and more completely. Window dressing will not suffice. But the truth is, that $3.5 million and even combined with the funds raised by TAA partners, is not enough. Well, the fact is none of us are doing enough to save our sport. Forget the moral issue; we are stewards of a sport that goes back hundreds of years, but our society has different demands upon us now and we either deal with those demands or perish. And yes, despite TAA efforts to spread the burden evenly, some may be doing more than others. But like a post position, sometimes it is not always fair. Try as we might, we don’t have time to be perfectly even. There are some individuals and organizations who understand the seriousness of the issue. But frankly, most individuals and organizations view this as “optional charity” and support the effort as long as it is voluntary and preferably as long as the bill goes elsewhere. So here’s the reality. There is no elsewhere. It is our sport to preserve. Only the substantial resolution to the welfare of Thoroughbreds exiting from racing competition, ensuring that they have a soft landing, will do. The investment in aftercare is better viewed as an insurance premium, as in a business expense, or if you prefer, an obligation to the sport. I am sure that Tom Brady doesn’t like paying into the NFL pension fund, as he’ll never draw a penny from it, but he does it because he has to, and because it keeps the sport healthy. With the TAA, our sport now has the basic infrastructure. TAA has research underway to tell us the scope of Thoroughbreds who are unaccounted for once they leave racing competition. The only real question is, do we have the will to substantially address the issue to the satisfaction of the public? The TAA monitors 20 revenue sources and is acutely aware of trying to be equitable, but we can only do so much. From big to small, be you breeders, owners, trainers, sales companies, racetracks, consignors, farm owners, syndicate managers, we must look to ourselves. We must all step up. If we don’t establish the complete truth to unwanted Thoroughbreds exiting the track as our ultimate defense, we can only expect more of these damning articles. And we will only have ourselves to blame.